Hi friends, back in February of 2013 I shared with you a recipe for Spaghetti and Clams and I would love to share it with you again. This is a quick and easy recipe and it's a family favorite in my house. In a big sauté pan add olive oil, garlic, and red pepper flakes. In another big pot filled three quarters of the way with water add salt and bring to a boil. Follow the package directions to cook the spaghetti. Meanwhile, sauté the oil, garlic, and red pepper flakes. When the garlic starts to brown add in the clams with the clam juice and sauté until the pasta is cooked. Drain the spaghetti and add to the clams. Mix together and serve with grated cheese. NOTE: If you do not like clams, you can substitute the clams with shrimp or any other seafood that you like! This recipe would be great served with Italian or Garlic Bread and a Salad. I hope you try this recipe and let me know how you liked it. Wishing everyone a wonderful weekend and see you all next week! 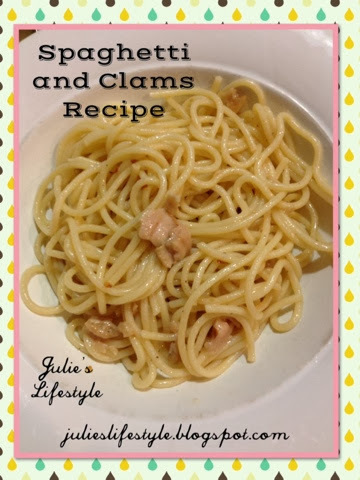 I am a spaghetti girl, but not a clam girl so maybe if I make this recipe I will become a spaghetti AND clam girl :) haha Thanks for sharing, dear Julie! We love spaghetti in this house and I make a mean garlic bread to go with it too. Thanks for sharing one of you family favorites today. This looks wonderful. Visiting from Chain Linky Blog. Thanks for sharing this recipe at TTF! 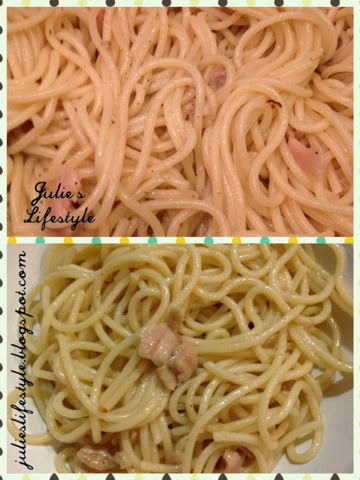 I love spaghetti and clams Julie! In fact, I love any kind of seafood :) Thank you! This recipe looks delicious. Thanks so much for sharing with Wednesday's Adorned From Above Link Party. Have a great week. This is one of our family favorites too - Thanks so much for linking this up to the Friday Frenzy - hope to see you again tomorrow! I never would have thought to try clam spaghetti! What a fun combination. Thanks for linking up to Snickerdoodle Sunday. This looks fantastic Julie, and I love that it is pantry friendly, I could make this any night of the week! Your Spaghetti and Clams looks delicious, my husband just love clams. Thanks so much for sharing your recipe with Full Plate Thursday and hope you have a great week. I have had spaghetti with clam sauce and I loved it. This would be a yummy variation. Thanks for sharing the recipe with SYC. Oh, this looks so good! This is the perfect Sunday night dinner at our house! Thank you so much for linking up to "The Yuck Stops Here" link party. We start the party every Monday night at 8:00 pm, and we would love to see you next week!